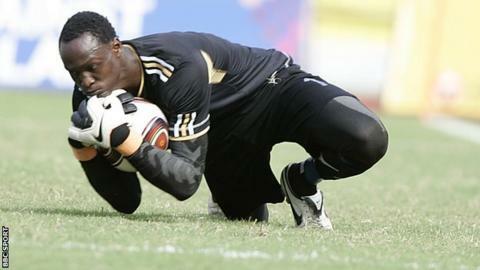 Uganda goalkeeper Abel Dhaira has died at the age of 28 at his base in Iceland after losing his battle against cancer. Dr. Bernard Ogwel, from the Federation of Uganda Football Associations (Fufa), confirmed the news on Sunday. "It is really sad for his family and Uganda as a country," Ogwel told BBC Sport. Dhaira played for Icelandic Premier League side IBV Vestmannaeyjar and was diagnosed with cancer in recent months. The goalkeeper made his debut for the national team in 2009 and helped the Cranes win the regional Council for East and Central African Football Associations (Cecafa) Senior Challenge Cup in 2012 at the Mandela National Stadium, Namboole. Former Cranes skipper Andrew Mwesigwa, who is now based in Vietnam, was amongst the first to pay tribute to his compatriot. "On a sad note we have lost our brother Abel Dhaira who has just died a few minutes back," Mwesigwa said. A former goalkeeper for Ugandan Premier League side URA FC, Dhaira's health deteriorated in January 2016 and he was hospitalised in Kampala at the Nsambya Hospital before returning to Iceland where he was receiving further treatment. Dhaira's coach at IBV Vestmannaeyjar, Bjarni Johannsson said last month that the club would do everything to help the player during this time of need. The club had organised a testimonial game for Dhaira early this month in Iceland. Dhaira had not featured for the Uganda Cranes since 2013, but he had always remained hopeful he would make a comeback. Dhaira also featured for Express FC in the Uganda Premier League before joining DR Congo's AS Vita and later Tanzania's Simba SC.